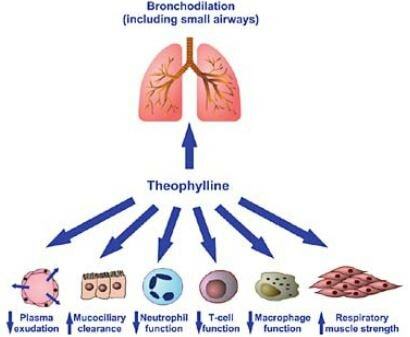 The drug theophylline is used as a treatment for several respiratory conditions. Like any other drugs, theophylline must be taken in its recommended dosage. A toxic dose of this drug may lead to a condition known as theophylline toxicity [1, 2]. Theophylline is an example of a xanthine derivative that stimulates the beta receptors of the body. This will cause a relaxation of the muscles found in the lungs, allowing it to expand and makes breathing of the easier. This medication is indicated to patients who are suffering from lung conditions such as bronchitis, asthma and emphysema. Theophylline is best absorbed by the body orally and it is rapidly distributed to the body. Side effects that may be experienced by taking theophylline include chest pain, seizures, arrhythmia, vomiting that is persistent, lightheadedness or fainting spells and shaking or tremors. People who are taking this medication are advised to limit the intake of caffeinated drinks or chocolates to avoid an increased amount of xanthine in the blood [1, 2, 3]. How much is Theophylline Toxicity? Adults are may be given about 300-600mg of Theophylline per day depending on their condition. This amount is equivalent to the therapeutic dose which is between 10-20mg/L. If the amount of 25mg/L, it will be critical for the individual and they will begin to manifest symptoms of toxicity. More severe effects of toxicity will present itself once the serum level reaches 100mg/L. An overdose in theophylline prolongs the absorption of the drug and the take it takes for the body to excrete the drug from the body. Acute toxicity occurs with the ingestion of a high dose of theophylline while chronic toxicity occurs with the accumulation of the drug in the body . 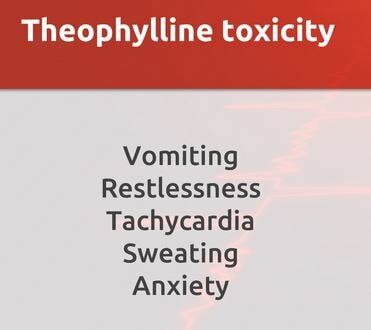 What are Theophylline Toxicity symptoms? Initial symptoms of the toxicity include vomiting, tachycardia or increased heart rate, tachypnea or increased respirations, anxiety and development of tremors. If a severe toxicity had occurred, the tachycardia may develop into supraventricular tachycardia, atrial flutter and fibrillation and ventricular tachycardia. Metabolic changes include decreased potassium, magnesium and phosphate serum level. There may even be metabolic acidosis and respiratory alkalosis. Once the patient has started to present with seizures, it signifies a severe toxicity and shows a poor prognosis for the patient’s condition [1, 2, 3, 4, 5]. What is Theophylline Toxicity management? The initial priority when the patient is sent to the hospital is to stabilize their airway, breathing and circulation. Their condition will be monitored and there may be a need to perform an emergency intubation as it is needed by the patient. A vascular access may be placed in order to transfuse blood in case it will be needed by the patient. If the ingestion had occurred less than an hour ago, a gastric lavage may be performed or a dose of activated charcoal may be given to the patient to reduce the amount of theophylline in the body. The airway of the patient must be covered prior to giving the charcoal in order to avoid aspiration. Electrolyte solution will also be administered to return them to normal levels. The seizures that the patient manifest will be treated using benzodiazepines although they may be resistant to treatment. Other symptoms of the patient will be treated with other medications. The condition of the patient will be monitored throughout the treatment and they will be discharged once they have become asymptomatic [1, 2, 3, 4, 5]. How to prevent Theophylline Toxicity? In order to prevent an overdose in theophylline, the medications must be taken as directed. Any untoward side effects must be reported immediately to the physician in order to be addressed and complications will be avoided. Medications must be placed in tampered-proof bottles and labeled properly. They should be kept in a place that is out of children’s reach in order to avoid accidental ingestion by children [1, 2, 3, 4, 5]. Mohamad, N., Halim, N. N., & Ahmad, R. (2009). Theophylline toxicity: A case report of the survival of an undiagnosed patient who presented to the emergency department. The Malaysian Journal of Medical Sciences, 33-37.